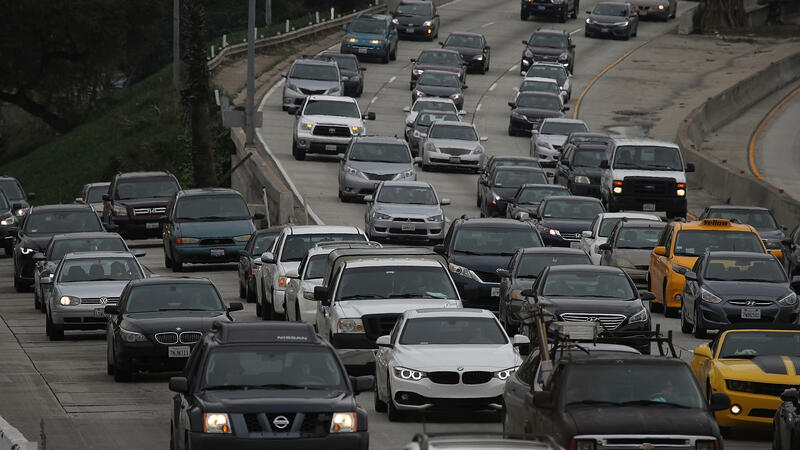 Cars on Highway 101 in Los Angeles on Tuesday. Around the nation, Americans drove a record number of miles last year. It's the fifth consecutive year of increased miles driven on public roads and highways, reflecting a strengthening economy, but it also "underscores the demands facing American's roads and bridges," according to a statement from the FHWA, "and reaffirms calls for greater investment in surface transportation infrastructure." Lower gasoline prices are helping fuel the increase in driving, as the cost of a gallon averages $2.28 nationwide, according to AAA, and the price has remained relatively steady in recent months. The strengthening economy has lowered unemployment, which means more people are driving to work and more discretionary income has more people out and about driving. The increase in driving has also increased gasoline consumption, which hit a record high back in June but because vehicles are becoming more fuel efficient, and there are more hybrid, electric, and natural gas vehicles on the road, the country is not burning gasoline at the same rate that driving is increasing. That's got many policy leaders and lawmakers considering alternatives to gas and diesel taxes to fund transportation infrastructure needs. Some states are experimenting with a tax on vehicle miles driven to augment or even replace the gas tax, and there are similar calls on the federal level too. The federal gasoline tax has remained at 18.4 cents a gallon since 1993, doesn't keep pace with inflation, and fails to capture revenue from vehicles using alternative fuels. One downside to the increase in vehicle miles driven is worsening traffic congestion. The mapping and navigation software company TomTom analyzed GPS data from around the country and finds that traffic congestion was about 2 to 4 percent worse in most cities last year than it was in 2015. The annual TomTom Traffic Index ranks Los Angeles as the worst U.S. city in terms of traffic congestion, followed by San Francisco, New York, Seattle and San Jose. Rounding out the top 10 are Miami, Portland, Honolulu, Washington, DC and Boston. The GPS data show that in Los Angeles, trips take, on average, 44 minutes longer than if traffic was free-flowing. "That's quite a bit," says Nitin Kartik, director of business development for TomTom. "When you look at that on an annual basis, in Los Angeles, people are wasting about 170 hours sitting in traffic." That time wasted in traffic increases fuel consumption and air pollution, and reduces productivity. But Kartik says if just five percent of drivers change their commuting plans by leaving earlier, later or taking public transportation or biking to work, that can reduce traffic congestion at peak travel times by up to 30 percent. No American city cracks the top ten globally, as Mexico City, Bangkok, and Jakarta have the worst traffic congestion in the world. Another downside to more traffic is more crashes. The National Safety Council says traffic fatalities increased 6 percent last year and topped 40,000 for the first time since 2007, but on part of that sharp increase can be attributed to the less than 3 percent growth in vehicle miles traveled. What's even more troubling is that the rate of fatal crashes is increasing at a time when vehicles mechanically are becoming safer. Experts cite speed, distracted driving, and alcohol as the top three killers on the road.